We've taken three of our favorite precious oils and blended them with our massage base to create sublime, romantic and completely natural perfumes. These 5% blends come in beautiful cobalt blue roll on bottles, perfect for carrying with you wherever you go. We figured the hardest decision you'd have to make with these is which one to get? So, we've made it easy by offering a three-pack with extra savings. 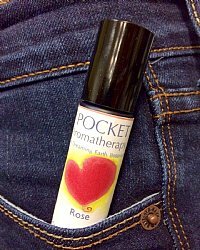 Available singly in Jasmine, Rose and Sandalwood.